Follow the steps below to reassemble the game components after playing Secret of Dr Gravely’s Retreat. Pass the game on to a friend to try! Fold Scene Card 1 as shown and reseal with circle tape (apply new tape if necessary). Lock the blue prisoner back up by following the steps in this video – CLICK HERE. Place the blue prisoner back inside the Blue Cell Door envelope. Reseal the envelope with circle tape (apply new tape if necessary). Lock the green prisoner back up by following the steps in this video – CLICK HERE. Place the green prisoner back inside the Green Cell Door envelope. Reseal the envelope with circle tape (apply new tape if necessary). Place the 2 large jig-saw key pieces in the center of the red prisoner card. 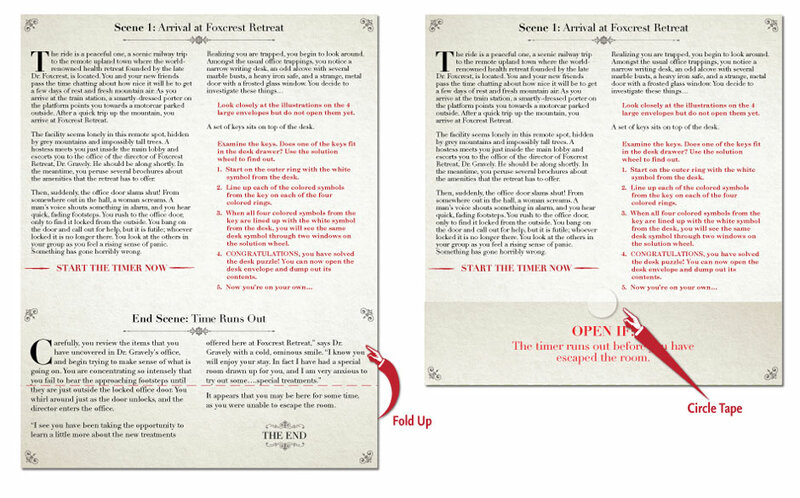 Lock the red prisoner back up by following the steps in this video – CLICK HERE. Place the red prisoner back inside the Red Cell Door envelope. Reseal the envelope with circle tape (apply new tape if necessary). Place Scene Card 8 and the Empty Cell Image back inside the Yellow Cell Door envelope. Place Scene Card 4 and the 4 Cell Door envelopes (repacked and sealed) back inside The Alcove envelope. Reseal the envelope with circle tape (apply new tape if necessary). Fold the Poem in half along the fold line. Place Scene Card 2, the Safe Dial, the Letter, and the Poem back inside The Desk envelope. Place Scene Card 3, the 6 remaining jig-saw key pieces, the Folders, the Alcove Key, and the 3 Blue Cell Lock pieces back inside The Safe envelope. Reseal the envelope with circle tape (apply new tape if necessary). Fold Scene Card 11 in half along the fold line. Place Scene Card 11 back inside the Test Tubes envelope. Place Scene Card 10 and the Test Tubes envelope (repacked and sealed) back inside The Machine envelope. Reseal the envelope with circle tape (apply new tape if necessary). Fold in the sides of Scene Card 9 and re-seal with circle tape as shown (apply new tape if necessary). Fold Scene Card 9 in half along the fold line. Place Scene Card 9, The Machine envelope (repacked and sealed), and the 4 Folding Puzzle pieces back inside The Laboratory Door envelope. Repack the instruction manual, Scene Card 1, the 4 large envelopes (repacked and sealed) and the Solution Wheel back into the box as shown. Subscribe below to be the first to hear when exclusive content around our Escape The Room series of games is released, including animated videos and free online puzzles!